The Association Les Moustachus d'Alsace was formed on 21 October 2000. The West Flanders Moustache Club was formed a few years ago. They organised an international event in Bruges in October 2002. Formed in 1978 by Willy Dupon, the Snorrenclub has been a friend of the Handlebar Club for over twenty years. Click on the 'Union Jack' on their home page to find a summary in English. Formed in 1985 their web site is in Flemish and English. This web site is in Flemish only. This site has information about a number of Beard Clubs throughout Germany. Höfen / Enz is an attractive village in the Black Forest, and its main claim to fame is its Beard and Moustache Club. The club members are very active, including organising various championships such as the one at Pforzheim a few years ago. They visited us for our 50th anniversary. Bart & Kultur Club "Belle Moustache!" Founded in May 2001 by our member Jürgen Burkhardt, this club's aim is to make moustaches popular in the Stuttgart area. 1. Berliner Bart-Club 1996 e.V. The Berlin Beard Club are also active participants in international activities, being well represented at the 1999 World Championships in Sweden. Ostbayerischer Bart- und Schnauzerclub 1996 e.V. 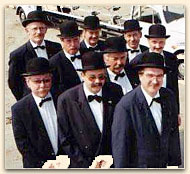 The First Dutch Moustache Club was founded in 1985. The "Club Baffi & Barbi" of Bergamo, in Northern Italy hosted the European Championship in 2002. A "Festival dei Baffi" (moustaches) is held each year in Montemesola (TA) in the south of Italy. The Norske Mustachclub is based in Trondheim, Norway. The Svenska Mustaschklubben is based in Malmö, Sweden, and was founded in 1984 by Swedish members of the Handlebar Club. They organised the 1999 World Championships in Ystad. Kalle Fernholm is Secretary of the club and also a member of the Handlebar Club. This club organised what was claimed to be Europe's biggest Beard and Moustache event, in April 2002. The Whisker Club is based in Bremerton, Washington, USA. They now have their own web site. Shawn's one-stop resource for beardsmen and mustachioed men everywhere! Giving in-depth guides to the men's grooming world. This is a social networking site for men who grow facial hair, & their admirers!! This site, created in September 2001, aims to have the largest collection of Moustaches on the internet. No, they are not a Moustache or Beard Club, but quite a few members of the Handlebar Club are also members of the Pipe Club of London. And the annual darts matches against the pipe smokers are a regular feature of our programme. If you would like us to link to your club on this page, or you would like to suggest a relevant site for inclusion in our list, please contact the or any committee member, with your club or other relevant Web site's URL, logo, and/or contact e-mail address.